Hilary was an amazing tour guide full of interesting facts and architectural details of the beautiful, historic buildings we learned about. I would highly recommend this tour to anyone who comes to Chicago. Super! Excellent guide. Easy to follow and understand. Highly recommanded. Hilary is a fantastic person. We loved this tour. It was so much more than architecture. Hillary was an excellent tour guide, giving us fascinating details about the buildings and society of this great city. When we asked questions she knew the answers and presented them in a colorful, story-telling fashion. The 2 hour, 1.5 walk was gentle and she pointed out several other things to do as we passed by. We took advantage of her suggestions and spent a delightful afternoon following her recommendations. Part of the magic was listening to Hillary. She is a smart, energized, charismatic young young woman who loves her work. We even met Mayor Rahm Emmanuel at the Chicago Public Library! We joked with Hillary about her connections to famous people and she admitted that she couldn't guarantee the mayor, but to us it fit right in with this experience. Even if you live in Chicago, you should do this tour. You will be glad that you did, and definitely be prepared for great photos. 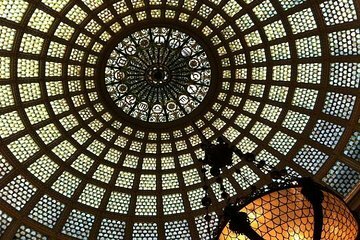 This is a great two-hour architectural walking tour that takes you inside many of the hidden treasures in the Loop, from late 1800s, to Frank Lloyd Wright, to art deco, modernist and post-modernist. Our tour guide Hillary is the company owner, very engaging and a font of knowledge. Highly recommended and well worth the price. We enjoyed our time with Hillary. She made the tour personal and it was a great introduction to the city as this was our first time in Chicago. Very fun and personal. Will attend another tour when back in town. Hillary is a guide who really likes to learn the group inside things about the chicago buildings. She is very communative. She treats the group members very professional. We were with our teenage kids 16 and 18. They also liked the tour.